I use multiple report controls in an application for tracking stock market trades. One of those controls is an account list that allows the user to edit an account value. When the value is saved, the current report control is updated, and related UI components are sent a message about the update so they can do whatever they need to do, and in some cases, that means refreshing the contents of another report control that is currently out of view of the user. 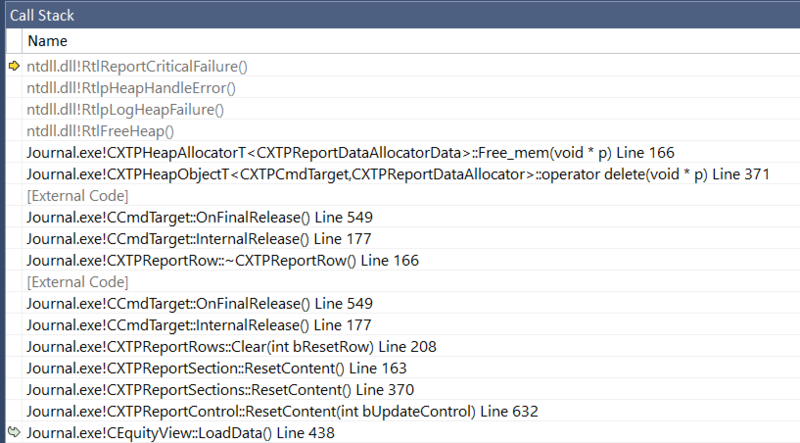 I have found that after 3-4 account value updates, one of the other report controls crashes with a heap corruption error when calling ResetContent(). I have not been able yet to track down what's going wrong, so I thought I would put this out there and ask for help. It is not likely a threading issue because all of the action occurs in the UI thread. I had set this problem aside for awhile, but came back to it today, and figured out what was wrong. I was doing it correctly in most other places, but I guess my brain stalled when writing the broken code.